Higgins Sunburst Fruit to Nuts Gourmet Natural Treat. Sunburst Gourmet Natural Treats for birds are an assortment of fun, healthy, natural snack mixes that supplement your pet's regular diet. 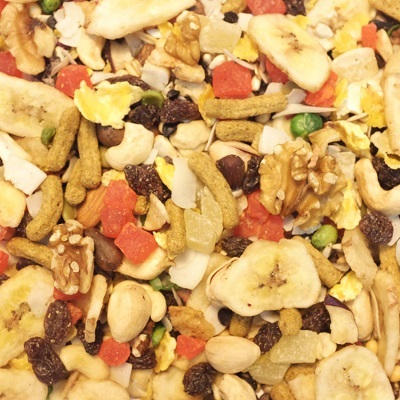 Fruit to Nuts for Conures, Parrots and Macaws is a blend of dried fruits, vegetables and assorted nuts that create a premium bird "trail mix". Bananas, raisins, almonds, green peas and more all add variety to your pet's daily diet. Bananas, Papaya, Pineapple, Raisins, Safflower, Buckwheat, Oats, Soybeans, Corn, Walnuts, Apples, Almonds, Cashews, Coconut, Pistachios, Green Peas, Pumpkin Seeds, Dehydrated Black Beans, Hazelnuts, Pine Nuts, Ground Corn, Soybean Meal, Ground Soybean Hulls, Corn Gluten Meal, Soybean Oil, Sugar, Dicalcium Phosphate, Calcium Carbonate, Salt, Brewer's Dried Yeast, Alfalfa Meal, DL-Methionine, L-Ascorbyl-2-Polyphosphate (Source of Vitamin C), Pyridoxine Hydrochloride, Taurine, Vitamin D3 Supplement, Vitamin B12 Supplement, Menadione Sodium Bisulfite Complex (Source of Vitamin K), Choline Chloride, Vitamin E Supplement, Folic Acid, Mixed Tocopherols (preservative), Calcium Pantothenate, Vitamin A Supplement, Biotin, Thiamin Mononitrate, Niacin, Riboflavin Supplement, Copper Sulfate, Zinc Oxide, L-Lysine, Manganous Oxide, Ferrous Carbonate, Zinc Sulfate, Calcium Iodate, Cobalt Carbonate, Sodium Selenite. Sunburst Treats can be fed in a separate treat dish or mixed with your pet's daily food. Discard any unused portion before feeding again. Feed treats to not exceed 20% of your pet bird's total daily food consumption. This helps ensure that your pet is receiving the required nutrients from its regular diet. We recommend one of Higgins premium diets like Sunburst Gourmet Blend, Safflower Gold and Vita Seed. Be sure to try all the Sunburst Natural Treat flavors!